When lessons aren’t learned, they continue to hurt people (and causes). When you need an inequality to justify and explain, there is something wrong with that cause, that justification. In July, 2017, three Israelis were brutally murdered. In the aftermath of those murders, Palestinians took to the fields protesting violently. Remember, it was during those protests, while they were attacking Israeli soldiers, three Palestinians died. Most important, the soldiers did not go to murder the Palestinians; they went to quell violent rioting. First, three people were murdered; and following that, three people died. Therefore, not equivalent in any way. Those who were murdered did nothing to cause their deaths. They were in their home, celebrating a new child born to the family. The three who died chose the path in which their lives would end by choosing to riot, choosing to attack soldiers, and in the end, choosing to die. In response, Israel Blogger featured a post written by one of our top bloggers, Paula Stern, titled Reprehensible Comparisons. Sadly, it wasn’t the first time that Sarah Tuttle-Singer appears in this blog and sadly, it wasn’t the last. Back to those “lessons not learned” concept. A few days ago, a 32-year-old father of four was stabbed to death in the Old City of Jerusalem. The Times of Israel reported that Adiel Kolman was killed. In truth, that too is a great evil. Adiel wasn’t killed…he was murdered. There are reasons to kill; there are no reasons to murder. Once again, their New Media Editor quickly took to Twitter to generate traffic to their website and added another layer of insult, “he died.” No, actually, he was murdered. Today, Ms Tuttle-Singer appears on Elder of Ziyon’s blog in a post titled Equality in Death. In this article, Varda Meyers Epstein takes Sarah Tuttle-Singer to task for this attempt to “white-wash” the tragedy of Adiel Kolman’s murder. More, Epstein’s article very effectively shows how offensive the deliberate manipulation of people’s emotions can be. In attempting to seek “equality” where none exists, once again Tuttle-Singer causes great harm and insult. 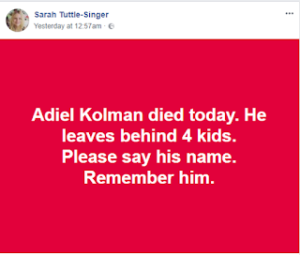 Adiel Kolman was murdered. In cold blood. Tragically, his children were orphaned as a result of hatred and violence. Clearly, it was no accident. You should remember Kolman’s name and those of thousands of other victims of Palestinian terrorism. Always, you should also remember that they were murdered. No, they did not die….they were murdered. That simple. That horrible. And that true.